We have played a lot of games has content like police fighting crime, heroes fighting bad guys to protect the world… But have you ever tried playing a game in which you are a thief? 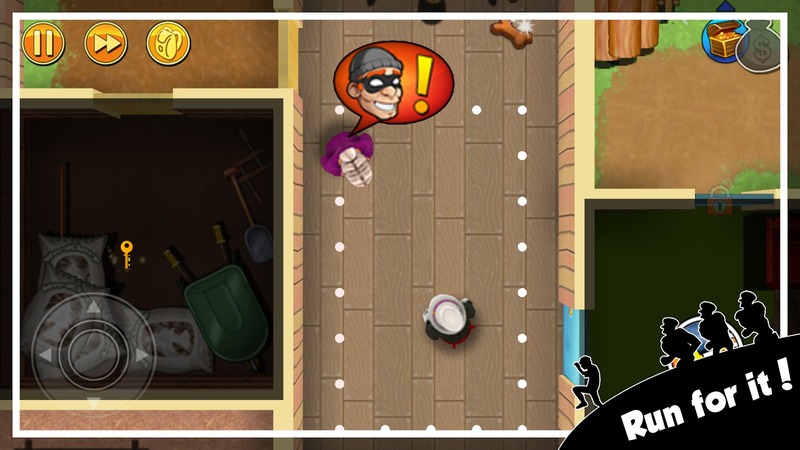 Theft is condemned by society, but if you want to experience the feeling of being a thief, play Robbery Bob – a funny game from the publisher Level Eight AB. This is a role-playing game has a lot of people love on mobile with fun gameplay and beautiful graphics, giving players the thrill of breaking into the heavily guarded houses to steal valuable items. If you’ve read stories about Robinhood stealing riches for the poor, then Bob is a bit different. He is without education, no occupation, once in jail for stealing and wanting to be a good person, but some other stealing masters see his talent and want Bob to do the last mission in exchange for a large sum of money. Of course, Bob agreed. When playing Robbery Bob, you have to learn to sneak around like a real thief. At the beginning of the game, you will meet another notorious thief, who will guide you in the game, the rules and what you need to do at each level. Start your burglary career with a house without security or someone inside, get the item in there and gently go back to the main door of the house and run away. If you feel it is too easy, don’t happy now because the levels that come with things that a thief does not like at all, maybe a big man, a fierce housewife with a pestle at hand or even the security guard, a dog with a security camera. To get the maximum score of the game (3 stars), you must complete all three criteria including undetected, “clean” all money in the house and completed within the specified time. It sounds difficult, but it’s not bad if you find the “hole” in the house and move to be undetected. In addition, Bob has the ability to hide as a ninja by hiding in the bush, sofa or even the toilet. Robbery Bob‘s controls are easy to navigate with the virtual key on the left that lets you move and a virtual key to the right to run (need time to recover). Bob moves sneakily, but when run he will cause noises to attract the attention of the people in the building. In addition, you should close the door every time you enter a room because if the owner finds a door open, he will go and check around and be able to spot you somewhere. Three chapters including 150 level will bring you to many different neighborhoods, not just one house. Some chapters (Bonus) require you to use cash to buy them. Each home corresponds to a level, in which a particular security system requires you to find a way to sneak in. I bet you that in the course of the game, you are caught by the guard not less than once. Guards are dangerous AI, but they are easy to guess and have many ways to pass. Also, do not forget to upgrade your stealing skills to such as moving faster or increasing physical strength to run longer. Because Robbery Bob is a fun game whose purpose is to entertain so the graphics of the game are quite bright and humorous. In addition, the top-down view allows the player to easily view adjacent rooms to find out which room is more secure. Ads usually appear when you start a new level, I recommend disconnect 3G, 4G, and Wifi for the smoother experience. 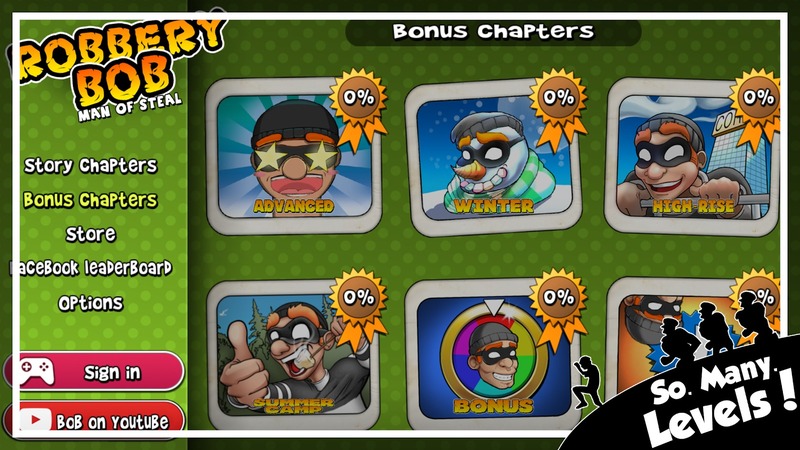 Overall, although the graphics are not really impressive but Robbery Bob is still worth playing by the fun gameplay. Start the journey of the notorious thief today by downloading the game to your phone via our links below. 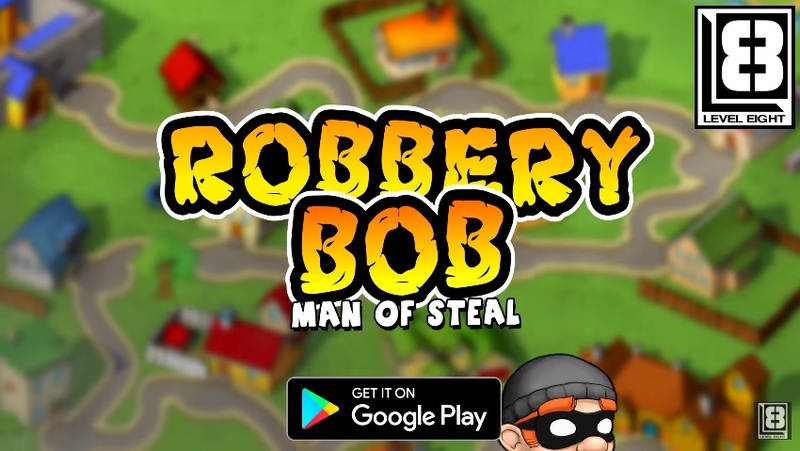 Robbery Bob MOD APK is ready to download! 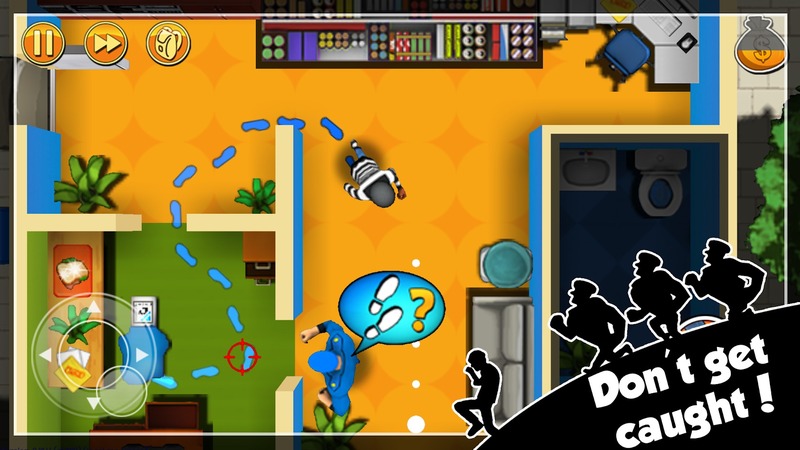 Depending on your needs, you can download Robbery Bob MOD APK or Robbery Bob Original APK. Or install from Google Play / App Store if you want.